I'm gonna go out on a limb here and say this is my idea of THE PERFECT MOVIE. I, on the other hand, chortled until I peed, and said aloud to myself on many occasions, "Oh my gosh, this. is. SO. PERFECT!" 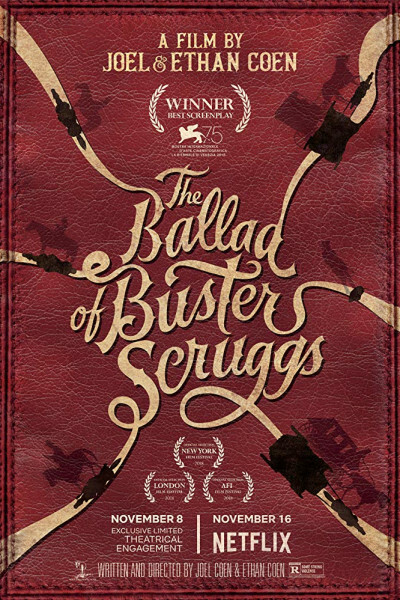 I'm among the more vocal haters of Hail, Caesar!, by the way, but Buster Scruggs feels insta-cult-classic like The Hudsucker Proxy, Fargo, The Big Lebowski, and No Country for Old Men. Heck, I get excited just recalling it, and have probably already succeeded at talking myself into watching it again tomorrow night. If you hate it, take comfort in Twain's encouragement when he reminded us that "If we both agree, one of us is unnecessary."